After taking on two Michigan teams last weekend, the Lincoln Stars will battle two teams from the state of Iowa this St. Patrick's Day weekend. Friday evening in Sioux City, IA the Stars will play the Musketeers. 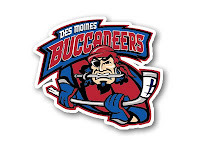 On Saturday, Lincoln will return to the IceBox to face off against the Des Moines Buccaneers. The puck will drop at 7:00pm CST for the game on Friday night. Puck drops at 7:05pm CST Saturday night in Lincoln. If you can't make to the games this weekend in Sioux City and/or Lincoln, you can follow the boxscores online via Pointstreak, listen to Stars radio announcer Mike Melbye on KLMS 1480 AM, or watch the games on FASTHockey for a fee. Lincoln enters this weekend with a record of 30-15-4 (64 points), and are in sole possession of second place in the USHL Western Conference. The Stars are only three points behind the first place Omaha Lancers (67 points), and Lincoln has two games in hand. Click here to see the current USHL standings. First up for the Stars this weekend will be the Sioux City Musketeers who have a record of 22-27-1 (46 points, fifth place in the USHL Eastern Conference). Lincoln will be looking to extend their current four-game road winning streak against the Muskies in SC. This will be the seventh time the Stars and Musketeers play one another this season. Lincoln has a 4-2-0 record against Sioux City in their six previous contests. The Stars are 2-1 against the Muskies at the Tyson Events Center in Sioux City this season, although the last meeting there didn't turn out so well for Lincoln. Back on 12/31/11, the Muskies rang in the new year with a 5-0 shutout of the Stars. Coming into the game against the Stars on Friday, the Muskies are riding a two game winning streak with impressive road wins against Waterloo, and Dubuque. However, the Musketeers have lost three in a row at home. The Muskies are so up and down, it's hard to know what team will show up from game to game. They are the very definition of a "Jekyll and Hyde" team. They'll go 4-5 games in a row where they look great, and beat some of the top teams in the USHL. Then suddenly they'll lose multiple games in a row and play terrible hockey. On a Friday night they'll win big, but will crap the bed the next night. They are a frustrating team to be a fan of, and I know a few of those fans. On Saturday, the Stars will celebrate St. Patrick's Day against the Des Moines Buccaneers (20-25-4, fifth place in the USHL Western Conference) at the IceBox. This will be the fifth time the Stars and Bucs have knocked heads this season with Lincoln holding a 4-0 record in their previous four contests. The Stars have outscored the Bucs 12-2 in their previous two meetings at the IceBox, both blowout wins for Lincoln. The Bucs are battling it out with two other teams (Sioux City, Tri-City) for that last playoff spot in the USHL Western Conference. Des Moines is barely treading water, however, having lost three in a row coming into this weekend. The Bucs do not play this Friday night, so they will be well rested for the Stars on Saturday night at the IceBox. There might be some Bucs players missing from the lineup this weekend due to an unfortunate incident last weekend at Buccaneer Arena in Des Moines. Click here and here to read more about that. The USHL and local law enforcement in Des Moines are still investigating, so it will be interesting to see how this plays out. Unless you've been living in a hole, you should be well aware by now that the Stars will be holding their annual "Jerseys Off Our Backs" auction after the game Saturday night at the IceBox. Click here and here to read more about that. Specially designed jerseys (designed by Stars trainer Corey Courtney) will be auctioned off after the game, and all proceeds to go to the American Cancer Society. Last year, a total of $34,000 was raised. Click here to see the results (and pictures) from last season's auction. Even if you don't want to, or can't afford to bid on a jersey, this is a very fun event to attend. It's interesting to watch fans go back and forth with their bids, and what the players will do to increase their bidding amount. Last year, the highest winning bid for a jersey went to Teemu Tiitinen for $3,000. I assume his jersey will be another top one on Saturday along with Kevin Roy, Brent Tate, Dominik Shine, and others. This is a great event for a great cause, so show up with your checkbook or plastic and bid away. Four points up for grabs this weekend! Start strong, finish stronger!